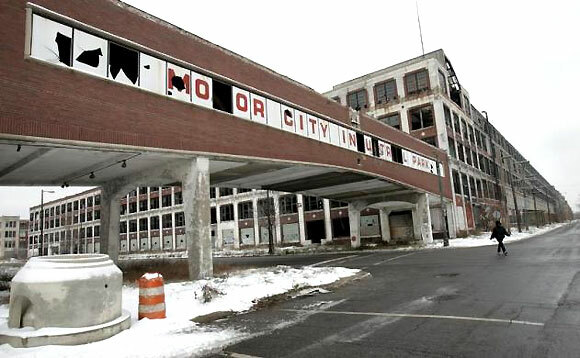 Detroit filed the largest municipal bankruptcy in US history on Thursday, setting the stage for a costly court battle with creditors and opening a new chapter in the long struggle to revive the city that was the cradle of the American auto industry. Michigan Governor Rick Snyder said he saw no other options for Detroit and approved Orr's request to file for Chapter 9 bankruptcy protection. "Detroit simply cannot raise enough revenue to meet its current obligations, and that is a situation that is only projected to get worse absent a bankruptcy filing," wrote Snyder, a Republican, in a letter accompanying the filing. 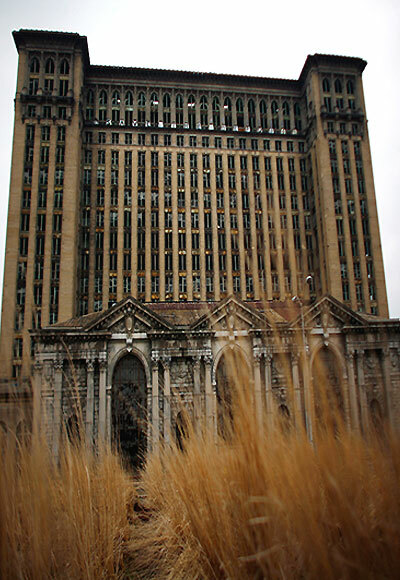 In some respects, Detroit's legacy as a model for American innovation is at stake as well. 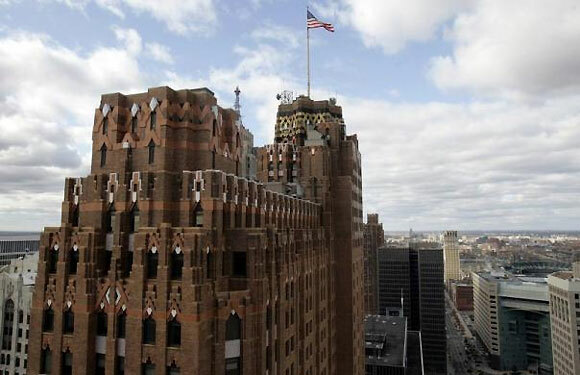 Its crippled condition threatens to overwhelm its image as the home of Henry Ford's pioneering assembly line and Motown's 1960s soul-music hit machine. More recently, the city has become an incubator for efforts to repopulate and reinvigorate an urban relic of a bygone, industrial age. New York, Cleveland and Philadelphia previously teetered on bankruptcy, but Detroit is the first major US city to go over the edge. 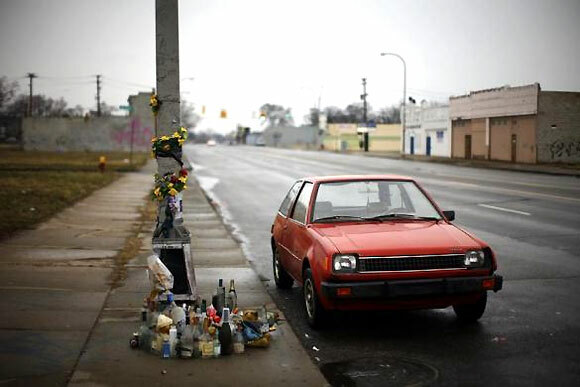 Image: A car is seen next a memorial in Detroit. Detroit has lost 25% of its population in the last decade, with just 700,000 residents remaining. The ranks of retirees outnumber the city's active workers by more than a 2-1 ratio. With a quarter of its buildings abandoned in some neighborhoods, no other American city has borne the brunt of deindustrialization so heavily. In his July 16 letter to the governor making the case for a bankruptcy filing, Orr laid bare the scope of the city's decline. "After decades of fiscal mismanagement; plummeting population, employment and revenues; decaying City infrastructure... Detroit today is a shell of the thriving metropolis that it once was," Orr wrote. A White House spokeswoman said Democratic US President Barack Obama and his senior team were monitoring the situation in Detroit closely. But unlike after the economic collapse of 2008, in which the federal government injected billions in cash into US auto makers General Motors Co and Chrysler as the first step of a quick turn through a managed bankruptcy process, Obama made no promises this time. 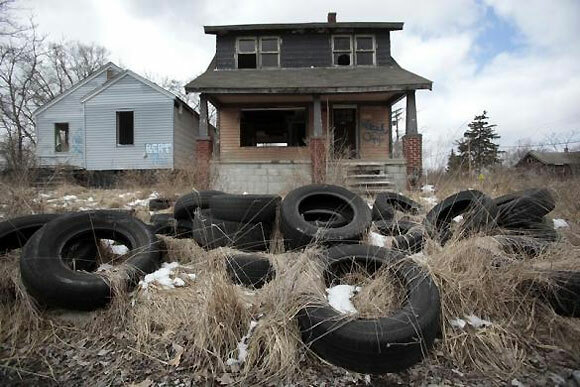 Image: Dumped tires sit in front of a vacant home in a once thriving neighborhood on the east side of Detroit. "While leaders on the ground in Michigan and the city's creditors understand that they must find a solution to Detroit's serious financial challenge, we remain committed to continuing our strong partnership with Detroit...," White House spokeswoman Amy Brundage said. Detroit was once synonymous with US manufacturing prowess. Its automotive giants switched production to planes, tanks and munitions during World War Two, earning the city the nickname of the "Arsenal of Democracy." Now the city's name has become synonymous with decline, decay and crime. A population that peaked at 1.8 million in the 1950s has fallen steadily since then. Manufacturing job losses and an exodus of white residents to the suburbs, which accelerated after race riots in the 1960s, have left huge swaths of this 80% black city blighted and crime-ridden. Image: A woman walks next to the abandoned Packard Motor Car Company building. Pay cuts and job reductions in the city's police and fire departments have added to the sense of insecurity. Budget cuts have left streetlights broken, fire hydrants out of order, and cop cars and fire trucks badly in need of repair. The city's murder rate is at its highest in nearly 40 years; only a third of Detroit's ambulances were in service in the first quarter of 2013; and an estimated 5,000 buildings a year intentionally are set on fire. But despite high taxes, the city's coffers have continued to dwindle. 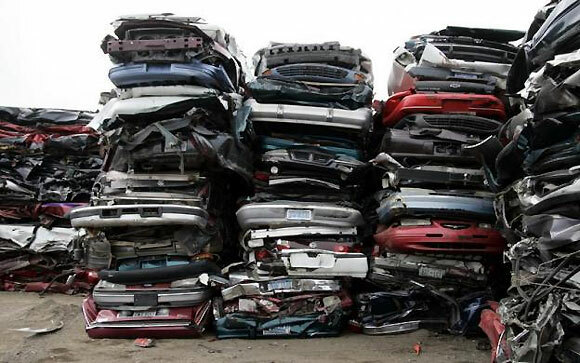 Image: Crushed vehicles sit in stacks before being shipped to the shredder. In June, the city's emergency manager, Orr, presented a proposal to creditors offering them pennies on the dollar. His plan had met with resistance from some creditors, most notably Detroit's two pension funds representing retired city workers. The funds recently filed lawsuits in a state court challenging the governor's ability to authorize Orr to file for bankruptcy. "This could run to tens-of-millions to hundreds-of-millions of dollars," he said. "We are planning to get through this process as expeditiously as possible," said Orr, an experienced bankruptcy lawyer before he took the emergency manager job. Image: The skyline of downtown Detroit. Corporate bankruptcy filings with far less at stake have taken much longer than Orr's targeted timeline. Richard Ciccarone, managing director of McDonnell Investment Management, said it would be a long, drawn out process. "They're dealing with very difficult issues in which there's not very much court precedent for a major city in this arena," he said. "It's a very complex landscape and it's one that's going to be watched very closely by municipal investors," said Robert Amodeo, a portfolio manager at Western Asset in New York. General Motors, the only major US automaker headquartered in Detroit, said in a statement that the company "is proud to call Detroit home and...(this is) a day that we and others hoped would not come. We believe, however, that today also can mark a clean start for the city." Ford Motor Co , which is based in the Detroit suburb of Dearborn, said it was "optimistic that governmental leaders will be successful in strengthening the community." But Ed McNeil, chief negotiator for a coalition of 33 unions that represent most of the service workers for the city of Detroit said the bankruptcy filing was about "busting the unions." "I've said all along that this is a power grab," said McNeil. "This is not about fixing the city's finances. It's about the governor and his own agenda to take over the city of Detroit." 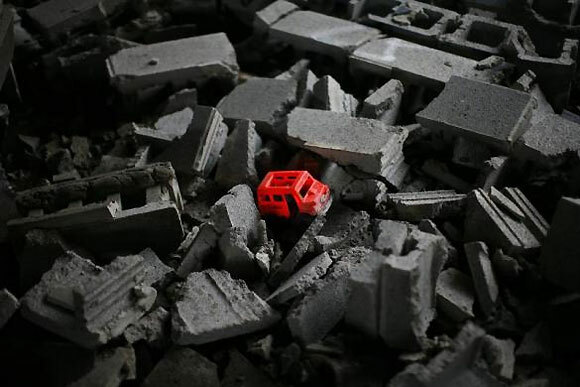 Image: A child's toy is seen in a pile of concrete blocks inside the abandoned and decaying Packard Motor Car Manufacturing Plant.